Causa Justa :: Just Cause envisions equal rights for people of color, immigrants, women, and all oppressed and exploited people. We envision an end to racism, and want to build a society based on self-determination, social justice, and solidarity. We envision a future without displacement through real estate speculation and forced migration. We envision a society where housing is a human right and all families thrive. We envision a future where corporate control is replaced by an economy run by the people and for the people, and political power is in the hands of those who need change the most. We envision a restoration of balance between humans and nature, and an end to ecological plunder. We believe that bringing together Black and Latino people is a crucial part of building a multi-racial people’s movement in the US that contributes to a global movement for liberation. In 2010, CJJC emerged from the strategic collaboration of two powerful organizations: St. Peter’s Housing Committee and Just Cause Oakland. These two organizations represented more than 30 years combined experience working toward housing and racial justice for African Americans and Latinos. As of 2015, we have now also merged People Organized to Win Employment Rights (POWER) in to our organization, expanding our issue and geographic reach even further. With offices in East and West Oakland and in San Francisco’s Mission and Bayview neighborhoods, we are a force for justice and unity among Black and Brown communities. Over the past five years, CJJC has brought together thousands of Latino and Black residents of San Francisco and Oakland to fight for housing and immigrants rights. The organization successfully passed over a dozen tenants rights ordinances in our two cities. We have fought deportations of our immigrant communities, winning sanctuary city status in both cities and later helping to get motions passed by both counties pledging due process and not to cooperate with ICE on immigration holds. Our tenants rights clinics have served more than 1,000 tenants each year, stopping hundreds of evictions in their tracks, preventing rent increases, and forcing landlords to do needed repairs. We ran foreclosure clinics as well, fighting back big banks and winning reprieve for dozens of homeowners. Founded in 1985, St. Peter’s Church Parish in the Mission District developed to address the deteriorating housing conditions, rampant landlord abuses, and escalating rent burdens that the community was facing. The primary mission of the organization was to preserve affordable rental housing units and protect the rights of low-income tenants. For 25 years, St. Peter’s operated a Housing Counseling program to aids tenants in retaining affordable rental units and improve housing that had fallen into disrepair. Now, as Causa Justa’s Mission office, we help tenants experiencing problems with harassment, lease issues, illegal rent increases, and evictions. Through counseling, advocacy, education and grassroots organizing, our clientele is afforded the opportunity to build its capacity to combat unfair housing practices. In 2001 our San Francisco office became a membership-based, and 3 years later expanded its service model to include organizing directly on immigrant rights and housing issues in the city. In 1999, Just Cause Oakland was founded to head the effort to mobilize for a citywide Just Cause for Eviction Ordinance. In 2002 we successfully passed citywide tenant protections against eviction for illegitimate reasons, such as landlord greed or discrimination. From 2003 through 2005 we focused our efforts on protecting affordable housing in new Oakland developments, and successfully secured the allocation of affordable housing set-asides and community benefits from new developments in West Oakland. 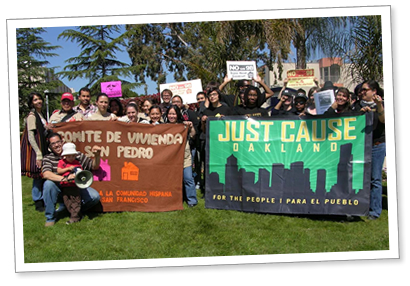 In 2006 and 2007, we launched an ongoing campaign for an Inclusionary Zoning Ordinance with the People’s Housing Coalition of Oakland. In 2008 we helped keep hundreds of affordable housing units from closing, and won an eight-month moratorium on water shut-offs in tenanted foreclosed homes for which banks had defaulted on utility bills. We also helped democratize decision-making structures for public housing in Oakland by facilitating a process for resident input. In 2009 we launched an ongoing campaign to combat the foreclosure crisis in under-resourced neighborhoods. Together, POWER members waged more than twenty campaigns to improve the living and working conditions for welfare workers, domestic workers, low-income tenants and other working class people of color. As a result of our campaigns, San Francisco’s welfare workers receive free public transportation and are protected by workplace health and safety protections just like all other workers protected by the California Occupational Safety and Health Administration. In coalition with other organizations, POWER helped to create San Francisco’s Living Wage Ordinance, and later worked successfully to raise the minimum wage, twice! In recent years, POWER’s youth program fought successfully to win Free Muni for youth and seniors.